Last March I started watching Erased, a mystery story that was being adapted by A-1 Pictures. Over the course of its airing many anime fans took notice of the series and by the end of its run we were all very engrossed in the story and how it would turn out. Fast forward a year and the manga is now being brought to English thanks to Yen Press, and I’m here to give my thoughts on it. For those of you who don’t know, Erased tells the story of Satoru Fujinuma, who is a fairly ordinary guy to the average eye. He’s a published mangaka but struggling to pen his next hit, so he’s also working part-time as a pizza deliverer guy. However, Satoru has a special ability that randomly triggers when someone around him is in danger. This ability sends Satoru back in time to a key moment before a fatal incident occurs – how far back depending on the situation. Once in the past, he must focus on what is going around him in order to solve the incident at hand before time will move forward normally again. If he misses the obvious fix then time loops round again and places Satoru back at the beginning to relive the scene over and over again. Usually this ability never sends Satoru back more than a few minutes, but after someone close to our hero is brutally murdered, he’s sent back eighteen years to when he was a child in elementary school. At the time many children in the neighborhood were being kidnapped and murdered, including a classmate of his: Kayo Hinazuki. Remembering the incident, Satoru vows to protect Kayo and discover the connection between the murder in the present day and the disappearance of the children so many years ago. With so much on the line, can he figure it out or will be forced to relive these days forever? Now I’m someone who likes a good mystery story, so when Erased came along I was more than happy to give it a shot. Apart from the fact that the series doesn’t outright explain Satoru’s abilities very well, or even why he has them, the story at hand is a good one. Even for someone like me, who has watched the anime through to the end, it’s not obvious who the kidnapper is, which so far has made revisiting the story enjoyable. There are just enough hints and revelations to keep readers on their toes and it’s easy to find yourself considering the numerous possibilities as the story unfolds. It’s a series that really makes you think and that’s the real charm it has going for it. This volume might be labelled as Volume 1 but actually it’s an omnibus that includes the first two volumes that were released in Japan. This is a good way of releasing the series in the west as the first volume doesn’t really drag you into the mystery as well as it could. It’s not until the end of the first volume that Satoru is sent to the far past, and as the real meat of the series takes place during this period, I’m glad that we had a second volume included to read through. A problem that I do have with the manga though is sadly quite a big one. My complaint lies with the artwork itself, which spends the majority of its time looking very disjointed. Characters’ heads are drawn at too sharp an angle, so they look much more pointed than they should. There are a few scenes where a character’s hair is blowing in the wind and not once does it look natural. Instead the hair looks very flat and, as with the faces, far too rigid in design. The artwork completely ruins any attempts the series makes in conveying emotion as the expressions never feel like they fit, and throughout the two volumes the eyes of our cast look completely empty – almost dead to me. Sure, pupils are drawn okay but they’re just black circles with almost no highlights to speak of. The other problem with the eyes is that, on the whole, they’re not circular enough and often drawn to a point (I think you can see where I’m going with this). It all makes for a very jarring experience. Initially I wondered if the issues with the artwork came about because the manga was older (not that there is anything wrong with old manga!). I honestly didn’t know. However, it turned out that Erased was first published in 2012 in Japan, so it’s not actually old at all. After that I wondered if maybe mangaka Kei Sanbe was just inexperienced, but with numerous titles to their name that appears to not be the case either. Erased ran in Japan from 2012 until 2016 and a part of me hopes that the artwork will improve in time, but I’m not willing to bet on it. It’ll be disappointing if the art doesn’t improve, because the anime of Erased was very emotional, and to lose that depth due to the artwork would be a crying shame. Overall I liked Erased enough as an anime to continue the manga for now, but I do think the manga is a hard sell for others who perhaps weren’t big fans of the anime or haven’t seen the series at all before. If you like the sound of the story then I recommend checking out the anime, but if you can overlook the artwork then the manga isn’t a bad starting point. 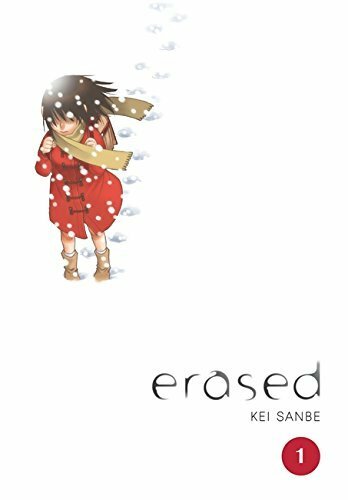 The Erased manga is by no means bad, it just isn’t quite as good as I was hoping it would be.